One of the most famous phrases concerning the Bronx: “The Bronx is burning” has been attributed to Howard Cosell during Game 2 of the 1977 World Series at Yankee Stadium. ABC news, which was covering the game held at the Bronx stadium, cut away several times during the broadcast to a helicopter shot of a large fire in the nearby South Bronx. Cosell and the other commentator Keith Jackson talked about the fire several times during the broadcast, observing that the large fire occurred in an abandoned apartment building. While the phrase “The Bronx is burning” was never in fact spoken by Cosell, the South Bronx did lose many, many buildings to fire and abandonment in the period between 1970 and 1980. Of the 289 census tracts in the Borough, seven lost 97% of their buildings and 44 lost more than 50% in this time frame, a period of widespread crisis in the Bronx. The Bronx is considered by the Census Bureau the most diverse area in the country. The 2013 census estimated that 46% of people in the Bronx are white and 43% are black / African American. 55% of the population identify themselves as being of Hispanic or Latino origin. 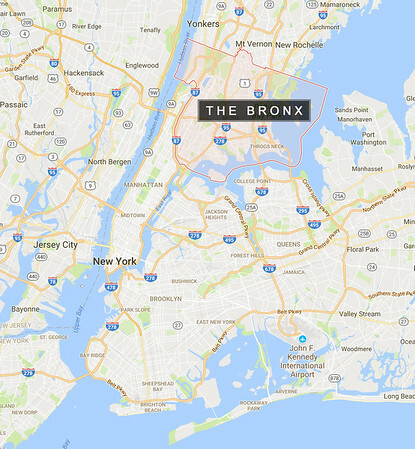 The Bronx has one of the five poorest congressional districts in the U.S. with poverty being particularly pronounced in the South Bronx, where 38% of residents are living below the poverty line. I am originally from New York City and never had any reason to visit the Bronx other than to see the Yankees at Yankee Stadium. While the Bronx does have other attractions such as the Bronx Zoo and Botanical gardens, tourism is practically non-existent, and people who are from New York or are visiting the City don’t go to the Bronx to stroll the streets as they would in Greenwich Village in Lower Manhattan or the gentrified neighborhoods of Brooklyn. It was against this backdrop that I decided to intentionally spend several days in the Bronx during a recent trip to New York, exploring the South Bronx in particular on foot, camera in hand. My impressions during this very brief peek were that the area continues to face challenges, but does this with a sense of community, identity, authenticity and vibrancy that persists in the face of a long history of adversity. Third Avenue is one of the main arterials running roughly north south through the middle of the south Bronx. The photo essay presented here is from a 3.5 mile long walk up Third Avenue, from the intersection of Third Avenue with E. 149th Street – at the north end of the Mott Haven neighborhood, to the end of Third Avenue at East 189th Street, just south of Fordham University. I-95 (locally called The Cross-Bronx Expressway), the main interstate highway on the east coast of the United States, crosses third Avenue roughly halfway through this distance. I came away from the experience with a sense of hope and optimism for the people of the South Bronx.